You must have already known by now that I completely love fiction especially thrillers, however, after a series of fictions in the last few months it was time for a non-fiction when I chanced upon Business Sutra, thanks to BlogAdda. 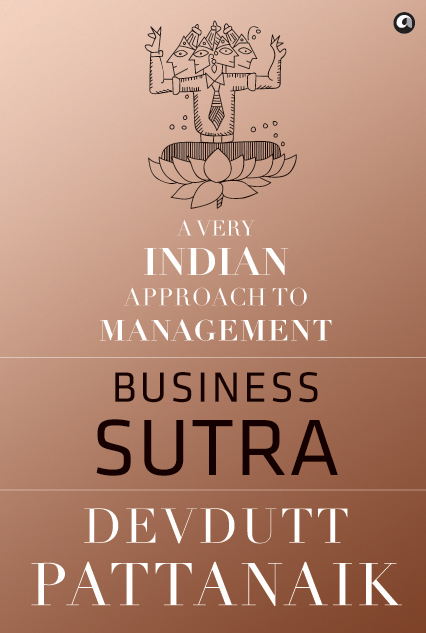 As mentioned on the cover it is undoubtedly – ‘A very Indian Approach to Management’ – and how. Author Devdutt Pattanaik has an eye for details and is master in observations in patterns and meanings in symbols. How he decodes symbols and meanings derived from the symbols is admirable. He starts with ‘as is belief, so is behaviour, so is business. If you think this book is about business or business models then you are wrong. We often forget the impact of our traditions our mythological stories characters on our belief or behaviour. The author brings forward and compares many Indian stories with that of west – Greek & Biblical and explains how they impact on our belief system and our way of life. The business management system that we are following in India are essentially a concept of the west where everyone has to fit within a mould to survive and excel. It’s the ‘ran-bhoomi’. We often ignore the power of imagination. But it’s this imagination which makes us different from all other animals. It’s the imagination which makes us do other things than eat, mate and survive. It’s the imagination that makes us a leader and anyone can be a leader. Today’s western management model somewhere arrests this scope of imagination in individuals. He explains them beautifully through philosophies from Hinduism, Jainism, and Buddhism. Though different stories and symbols the author brings together mythology and business. As you read you can figure out there are many of these which you know already but have never imagined in this context. That’s what made this book special for me. Devdutt Pattanaik is a multi-faceted man. After having studied Medicine and spending 15 years in the pharma business he is now the Chief Belief Officer with Future Group and a well-known author. You can read more about him here. Most of his writings are inspired from mythology. From different stories of Hinduism, Jainism and other religions you can relate to your workspace and your work life. I liked the way Pattanaik explains about the long term, short term goals, the caste system, and the case studies that he explains after every sutra. It might be also because I have been a student of sociology that these things appeal to me so much. The author’s drawings and illustrations make the read easier. I feel it’s a good read for everyone – if you are working or not, if you are in business or not. Publisher – Aleph Book Company and Promoted by Rupa & Company.